My flight from Birmingham to Hannover was always going to 'cut it fine' to make it to the gig on time, but when it was delayed by more than half an hour I feared I wouldn't see any of the show at all. 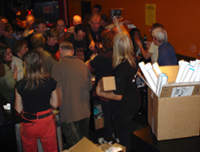 Mayhem at the merchandise table — the band signing CDs at Bochum. As luck would have it good progress was made and a fast taxi got me to the Pavillion just as the band kicked into 'Those About to Die'. To say the place was packed was an understatement (though Paraphernalia's attendance record for the venue still stands). This was the first time I had seen Barbara in the band and she was absolutely on fire. Moving from soprano to tenor made no difference as she fired off one inspirational solo after another, and the crowd responded wildly. The first half of the show had its moments but it didn't seem to click into place. In the intermission I was able to get closer to the stage as most people had gone to the bar. I had seen Colosseum in England since the reunion but seeing them in their own 'backyard' makes for quite a contrast; the atmosphere was electric. 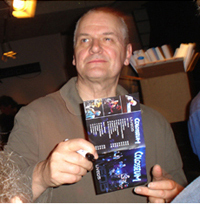 Jon Hiseman shows off the new album. So many of the band members are well known in Germany, but, when the band are introduced by Jon, the biggest cheers were reserved for Chris and Barbara. Whenever they play in Germany with their respective bands, they invariably draw bigger crowds than Colosseum.The second half of the show was an improvement and it didn't seem long before the band were taking the cheers of the crowd at the conclusion of a storming 'Lost Angeles'. I met up with Jon at the merchandise table where the new live album was doing brisk business. (Dave Greenslade is convinced it's the best album they have ever done.) Even by the third gig Jon was making plans to order a new batch of CDs as it was already clear that demand would soon outstrip supply. It was a real eye-opener to see so many women at the gig; something that would never happen in England. Venturing backstage I met Chris, Clem and Mark for the first time. I had previously conducted my interviews with Clem and Mark by e-mail. I knew that Mark was the comedian of the band and he was fascinated by my 'Brummie' accent. This was the first of some good hearted banter that continued throughout my stay with the band. It was back to the hotel for a few drinks with Dave, Clem, Mark and some of the crew. It made for fascinating listening as the gig was dissected and the things that worked or didn't work were mulled over. In the early hours I made my weary way to my room. Empty but soon to be jumping stage. 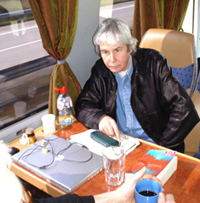 The following morning we boarded the tour bus and left the big city lights of Hannover for the more sedate and delightful little town of Worpswede. I had been told about this place but being there was a shock as it didn't seem to be the place to hold a rock gig. Its main street is clearly untouched by the heavy volume of traffic that afflicts so many towns and cities these days. Just off the main road reveals a delightful walk into a lovely wooded area. Worpswede is a town of art and during my walk I came across a couple of artists recording the local views for posterity. I chatted with one and it turned out she had recently appeared on German television. At 6:00pm I made my way to the venue for the sound check. The Music Hall is an intimate place with lots of character. 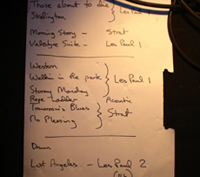 The sound wasn't too bad either as some of the new live album had been recorded there on the previous tour. Watching the band work was fascinating. 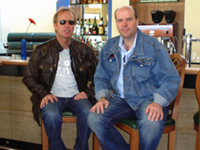 Mark and Clem worked out a smoother section in the 'Theme For an Imaginary Western' - 'Walking In The Park' - 'Stormy Monday Blues' medley. Another number they worked on was Jack Bruce's 'Morning Story'. A new addition to the set, there were a few rough edges to it. The fact that some of the numbers were still works in progress is evidenced by Clem using different intros for 'Tomorrow's Blues' on his old purple Stratocaster. At the end of the sound check Mark got into a funky groove and the rest of the band went with it, and very impressive it was too. I suggested to Mark afterwards it would have been a good intro to the show and segue it into 'Those About to Die'. The idea of Colosseum fans turning up and hearing a bit of funk is deliciously intriguing. The show kicked off at 9:00pm to a packed hall and after the first number Jon introduced Chris onto the stage where the band performed a number that had they had resurrected after a long sabbatical, 'Skellington'. 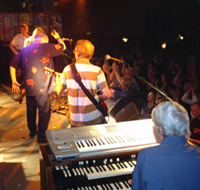 When Chris Farlowe walks on stage you know he is a star. His stage presence is immense and there are very few artists who have got this intangible quality with the voice to match. Barbara also made a big impression early in the gig, receiving great applause for her marvellous tenor solo, followed by Dave on his Korg Trinity. 'Morning Story' is next and Mark sang the first few lines beautifully. This song first appeared on Jack's Harmony Row album and you can see why the band have adopted it, with its epic qualities. By the end of the tour this could become the 'show stopper' as it's got everything it takes; a great song for Chris to sing and great backing vocals from Clem and Mark. It also features a raunchy soprano solo from Barbara and it affords Jon space to really go for it. The melody is so good it makes an instant impact. Jack Bruce/Pete Brown songs now make up quite a lot of the show, so Jon was keen to point out to the audience that, to musicians schooled in a similar background to that of Colosseum, it wasn't Lennon and McCartney that were their torch bearers but Jack and Pete. Hitting warp speed at Worpswede! The 'Valentyne Suite' has worn well over the years and is now bolstered with some interesting sections to keep it fresh. In the first theme Dave duets with Barbara but it isn't long before Jon and Mark join in. This is Clem's cue to retire to a seat at the back of the stage to sit things out for a few minutes. However, the piece ends with Clem's trademark tour de force solo, and he drives the band to a powerful climax. Jon introduces Clem to the audience as 'one of the great guitarists', and rightly so. The second half of the show begins with an astonishing vocal performance, not from Chris but from Mark. 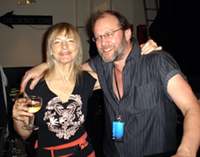 Barbara Thompson and Gert Lange (tour manager). The opening lines of 'Theme for an Imaginary Western' are sung solo by him. The power of his voice makes the hairs on the back of your neck stand up. You do have an inkling of this in his compelling vocal section during 'Valentyne Suite'. He seems to be singing that section with more grace and power than ever before. However, this tremendous performance begs the question. Have Colosseum underused Mark's voice in the past? 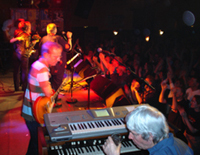 Dave got into a funky groove during 'Rope Ladder to The Moon' and unveiled his new sound, wowing the crowd with a clavinet sample on his Korg. Perhaps he should acquire more new sounds in the future? The final two numbers of the show nudge towards the new studio albums. 'Tomorrow's Blues' has been fully established as a classic in it's own right and gives Barbara another chance to show what she can do. Clem and Martyn, disgruntled and bewildered to find the bar is closed. The show ends with the best number of the night and a pulsating version of 'No Pleasin'. The number is tailor made for Jon who drives the band on relentlessly. Jon starts the encore with his drum solo and then it's into 'Lost Angeles'. This included a minute or so of 'Stairway to Heaven' with Chris plucking a few lines out of thin air. Clem even plays Gershwin's 'Summertime' in his solo and then came something you won't see very often...during Clem's solo Mark came across and they started exchanging riffs. I found out later it was something that had happened spontaneously and they were going with the flow. In the three gigs I witnessed it was different every night. An important aspect of a Colosseum show these days is the unsung hero, Mark Clarke. There is no doubt that he physically throws everything into the show; a great showman. He told me later that Colosseum's music was really physical to play, and this from someone who has played with Uriah Heep, Mountain and Rainbow. This takes its toll on his hand but he combats this with regular exercise in the hotel gym in the daytime. After a few drinks backstage it was time to walk back to the hotel in the early hours. The hotel bar was shut so it was straight to bed. Chris Farlowe and Clem Clempson. "Are we there yet?" wonders Dave Greenslade. 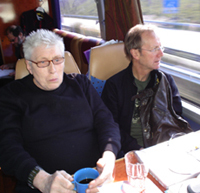 The next day it was the long trek to Bochum to negotiate and during the journey I managed to interview Chris Farlowe in depth. I got some really good stories, including a blinding tale of how he came to meet Marlon Brando. Brando even remembered his name when they met some years later in Helsinki as Chris's band watched in amazement, no doubt wondering: "How on earth does he know Marlon Brando?" I went to the front of the bus and chatted to Clem about one of his passions, football. As a boy he supported West Bromwich Albion and witnessed the great teams they really had in those days. In my day I supported local rivals Birmingham City and, as we are roughly the same age, I knew the Albion players he was talking about. He still watches football today, but we concurred it is a very different game. The time passed really quickly and before long the 170-odd miles had been rattled off. As the journey was so long there wasn't much time in the hotel before it was time to go down to the venue for the sound check. We passed Bochum football ground in the middle of their game with Hannover (from where I had flown in). We arrived at the old railway station that is the Bahnhof Langendreer at around 6:30pm to a crowd of autograph hunters, with the usual array of vinyl albums for the band to sign. It never ceases to amaze them where the fans get them from. The gig was sold out but Andre, the merchandising man, had a novel idea to sell more CDs. He went outside to offer the new album to fans that didn't have tickets and in the process sold 25 more copies! Chris Farlowe and Mark Clarke sign autographs for the fans. 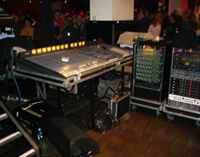 Mixing desk for that colossal sound. I started this gig watching from the side of the stage, but in the intermission it was suggested that I spend the rest of the show at the mixing desk with sound man Miles Ashton. This was the highlight of all the shows I had seen. Standing next to Miles you get the full and pristine sound of Colosseum. All the punch and majesty is experienced here and proof that Dave's description of Colosseum as a "fearsome animal" is totally accurate.It was also fascinating to watch Miles work. He did subtle things like add echo to Chris's voice in a quiet section, and then would do the same to one of Barbara's soprano solos. I asked him after the gig if it was pre-arranged with the band. He answered in the negative, proof that he has a large degree of autonomy in his work. However, the proof of the pudding is in the eating and the sound was fantastic. He has worked with Jon and Barbara for many years and it's clear he knows what's expected of him. 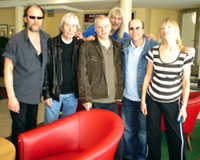 Gert Lange, Dave Greenslade, Jon Hiseman, Andre Bunning (merch), Martyn Hanson and Barbara Thompson. 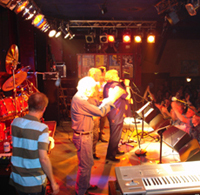 Bochum was my last gig with the band and there was a degree of sadness about it when it came to saying goodbyes. Colosseum had welcomed me into their world. It is a world that is unreal when living out of a suitcase. 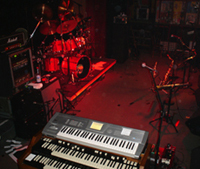 From the moment they get up in the morning, everything is geared towards the gig in the evening. The constant travelling, hotels and playing all adds up to a hard life. The gigs are arranged for months in advance and they must be fulfilled come what may! I left feeling drained and tired by the lifestyle on the road. Spotted at Hannover Railway Station — it seems the boys in the band even found time to open their own café! As I boarded my train to Hannover, I imagined what it would be like to have another 4 weeks of touring (and me not having to play) and experience the stresses that build up as show time approaches. I imagine that long before the end of the tour the band and crew become mentally and physically washed out. So where do the band go next? In February they received an incredible reception when they went to Tokyo, their first concerts in Japan. 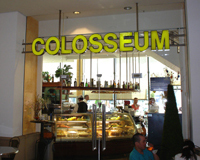 From my conversations with Barbara on the tour bus, it appears that Colosseum are still looking to the future. What they would like to do next is to tour places they have never been before.